Full extension, soft close slides ensure the drawers of your Mission Hills Bookcase extend fully and provide a quiet, slow, and controlled closure. 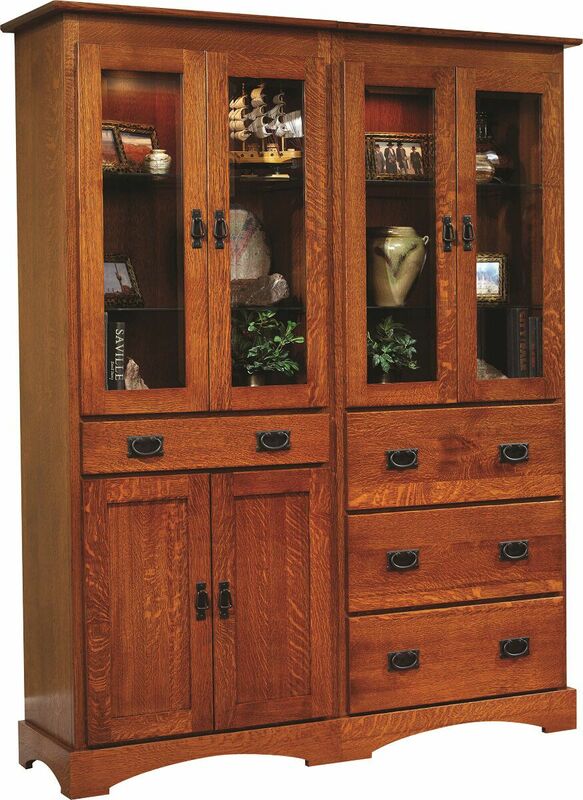 Place your keepsakes on the adjustable glass shelves of our Mission Hills Bookcase with beveled glass doors. Flooded with recessed lighting, the bookcase will beautifully display your literature, photographs, and artwork. Four base drawers and a double door cabinet add additional handy storage in your bedroom, den, or executive office space. The Mission Hills Bookcase is crafted of your selected hardwood then hand-rubbed with stain. To obtain the pictured look on your wooden bookcase, choose Quartersawn White Oak with our hand-rubbed Burnished Honey wood finish.